WPengine – Can You Install More than JUST WordPress? Can I Install Anything Other Than WordPress on WPengine? This was the question I had when I wanted to setup a support forum using Vanilla Forums. I’ve known WPengine to be a pretty strict host. For example, they have a list of blacklisted plugins that they routinely update: WPengine Disallowed Plugins. I figured they would be strict on WordPress-only for their hosting. 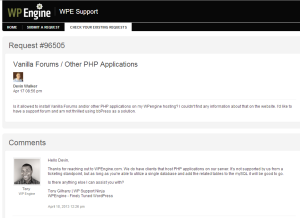 Is it allowed to install Vanilla Forums and/or other PHP applications on my WPengine hosting? I couldn’t find any information about that on the website. I’d like to have a support forum and am not thrilled using bbPress as a solution. Side note: I’ve been very happy with WPengine Support. Despite dealing with massive growth, they’ve maintained their responsiveness and are very knowledgeable. 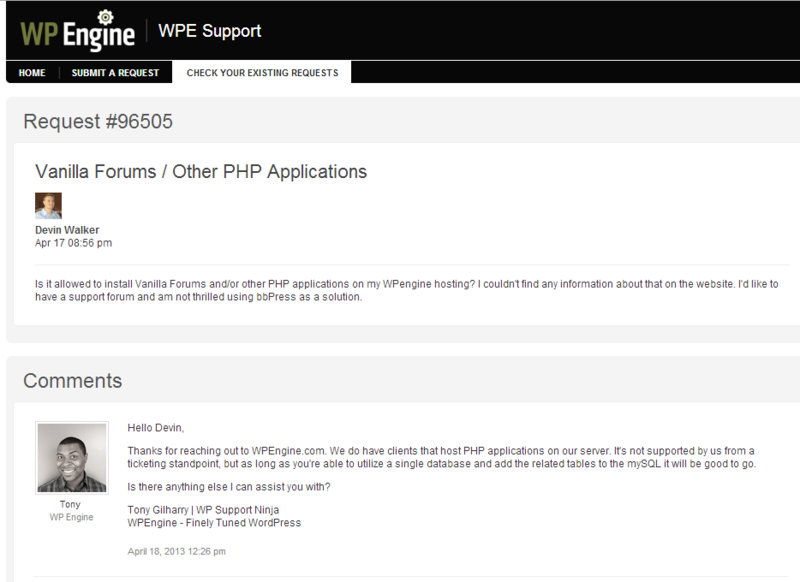 Thanks for reaching out to WPEngine.com. We do have clients that host PHP applications on our server. It’s not supported by us from a ticketing standpoint, but as long as you’re able to utilize a single database and add the related tables to the mySQL it will be good to go. The good thing is that with WPengine you can benefit from the environment’s incredible speed and reliability without being married to WordPress. I’ll update this article as I explore running other applications than WordPress on WPengine. They have a lot of great features like baked-in CDN and daily backup snapshots that I’m curious to see how they integrate with say, Vanilla Forums. Have you had experience working with anything other than WordPress on WPengine? Please post your comments below! Hey Devin, did you manage to get Vanilla Forums setup via WP Engine? I am looking to set-up Vanilla forums on our site but not entirely sure how to achieve this within the single database. Would be good to hear your experience. Do you have the single site plan? If so I believe you can still install Vanilla if you combine it in single database, not a very elegant solution though… I decided on just using bbPress for various reasons so never had a chance to install Vanilla on WP Engine. I was going to install it on a subdomain in a separate database though if I were to… hope this helps! Thanks for that, yes I was thinking that I was going to use a sub-domain but realised I am on single site plan so would need to combine databases. Will have to investigate further, thanks for your help.